So we decided to hang pictures today. We have done this eleven times now in our married life with very little drama. After trying two or three different places for the things we like best, and fighting for a great spot for our personal favorites, we usually agree on the best spots for everything and get to work measuring, leveling and hanging. Of course, now that we are tiny home minimalist, we should have been done by noon, right? By noon, we had a gash in one of the walls and two of our favorite pictures had broken frames. We only got one picture hung. Have you been watching television when the ads come on for the new picture hangers that stick to the wall and to the back of the picture, and…they saaaay… will never, ever damage your wall even if the picture is finally taken down ten or so years later? Have you watched as the confident lady pulls down on the sticky strip and it comes off without so much as a smudge on the wall? It’s lies…all lies! We went to Lowes and bought the things in every size to accommodate every weight. They weren’t that easy to work with to begin with, but just when we thought everything looked beautious, CRASH!! To the floor they went. The frames in splinters. Well, two of them anyway. We tried one twice, but when that didn’t work, I told Kip I wasn’t willing to chance it again. I could just see us awake all night wondering if pictures in an unoccupied tiny home make a noise when they fall even if no one is in the forest, I mean in the tiny house to hear them. Tomorrow we will be making a trip to Michael’s in Dallas or Tyler to get new frames or maybe have them frame them for us. The ones that splintered are old ones and they could use a little freshening up. But there are other places for money to go right now. The pit is deep and getting deeper. I’m really doing a lot of fantasizing about the 1939 life insurance policy the bank in Murdo discovered in an old safe deposit box my parents abandoned years and years ago. I know my parents, and they never would have forgotten they had something of value, anywhere. I can still imagine several scenarios all of which end with MG being a rich girl, and Billy would be wealthy, too, of course. I watched a show on HGTV last night. It was late, but I couldn’t sleep. It was about a couple who won $187 million dollars in the lottery. They were looking for a new house. They started with a self-determined budget of two million and ended up buying a mountain for five million. The whole thing overwhelmed me and made me nervous. Can you imagine all of the bad luck Kip and I could have in a place that cost us five million dollars? No thanks!! I would rather be a minimalist living in a tiny home with tiny problems. Note to Patti: Billy graduated with a class of twenty-four. There were only nine girls. He quoted some other statistics about how many were still living and how many of those showed up for reunions. It was really impressive, but I’ve forgotten the numbers. I’m late writing my post tonight because I have been working on Connie’s Story and Dakotah’s Story for the last couple of hours. It’s another long story, but because I have been given some great advice, I have taken on another edit of both books. I believe the stories are good, but they both still need a little finessing to make them exactly as I want them. We see these ducks every day on the road to our tiny home. It would help if I had a lot of money, but that could all change soon. Just as I thought this week couldn’t get any weirder, Billy and I got an email from the Jones County Bank in Murdo. They are sending us the contents of an old safe deposit box my parents had. One of the items is a life insurance policy from 1939. Dad was only twenty years old then. It probably won’t be worth anything, will it? Something tells me it probably lapsed somewhere along the line. Today, we spent a lot of time putting the furniture back together and getting some things ready for the move. Electricity helps, but we still need water to really clean the place and of course, we can’t move in without it. Here are a few pics of the furniture we organized. It doesn’t look like much, yet, but we’ll get there. I’ll show you pictures as we progress. I told you in the beginning, I would give you the good, the bad, and the ugly, and I have kept my promise. I want to tell you about one other thing that happened today. It’s important information; especially for people who have dogs. About two weeks ago, Cyndie started panting and drinking lots of water. We took her to the Vet right away, and the test they gave her showed her kidney functions weren’t what they should be. They gave her some medicine, and told us to give her a dog food that is easy on the kidneys, (low protein). She has been doing great since then. Today, when we were taking them all for a walk, we noticed Cyndie’s stool was full of blood. We were concerned to say the least and took her right to the Vet again. After talking about her symptoms, he told us it was caused by eating grass. I always thought dogs ate grass to calm an upset stomach, but this doctor said they eat it because it smells good and it tastes good; especially this time of year. The problem is they can’t digest it, and it can cut up their intestines, which he believes is what’s wrong with Cyndie. We’re grateful for the best news we’ve had all week. It could have been a much worse diagnosis. I’ll let you know if the symptoms disappear, but in the meantime, I wouldn’t let your dog eat a lot of grass if I were you. Cyndie has been munching too much around this RV park. Have a great night, everyone…and a wonderful weekend! We took another tiny step toward tiny home living yesterday. 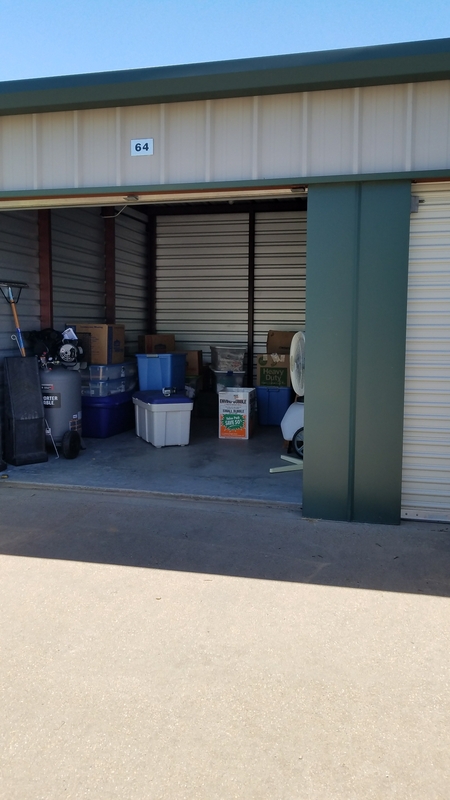 Since the RV garage is ready, we decided to move everything out of the three storage units we occupy, for a total if $150 per month, into the garage. Does this look like minimalist living to you? This is only the contents of one unit. We have two more to go. It’s ridiculous! I noticed many of these boxes were labeled, “garage.” Some were marked, “important tools.” I would be willing to bet 99.9% of Kip’s tools made the cut. Okay…full disclosure… I had more Beasterhop boxes than I remembered. And a few bunny paraphernalia I picked up at the church garage sale have.been riding around in the jeep with me. I’ll go back and read my goal notes. The question is, “Are we ready?” The answer is, “It doesn’t matter.” Like it or not. The time has come. Well, as soon as we get some electric juice and a water/sewer hook-up, we will be faced with ridding ourselves of a whole lot more antiminimalistic hangers on. We don’t need them…the lesson here is, if you do what we just did, you’ll have to handle everything twice…at least. Remember all the stuff we so proudly got rid of? On to something else. I had the facts wrong. I woke up in the middle of the night thinking, “What was I thinking?” Penny and Midnight were not involved like I said in the last blog. Remember? Berferd was Penny’s offspring. His father was a homeless and rather mangy mutt with a sad story, and there was no denying he was Berferd’s biological father. 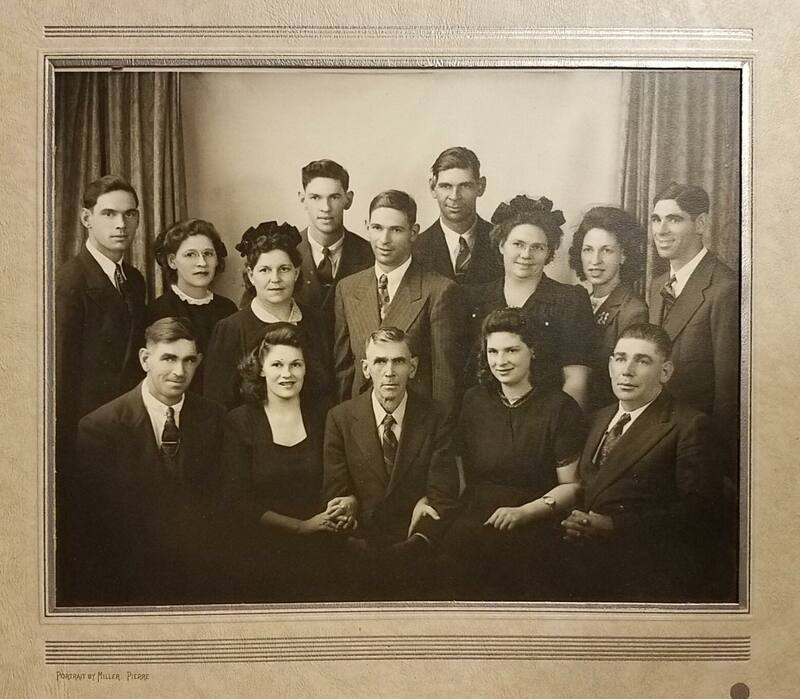 A couple of years ago, I wrote about how we discovered Berferd’s paternity. Someone found a deceased dog on the side of the road and thought he was Berferd. How many dogs have wirey, mangy looking hair in three colors? (Penny’s hair was copper colored.) When Berferd came home from eating popcorn at the show, we figured out the dog, who went to a better place, wasn’t him. It was his father. Poor Berferd had just lost his only known relative. Midnight was Scamp’s mother’s puppy daddy. That makes more sense anyway, because Scamp was all black like Midnight and he lived south of Hiway 16 where Midnight spent most of his time when he was visiting from Pennsylvania. Scamp’s mother must have lived in the neighborbood, too. Maybe Greg Miller knows who she was. Scamp was their dog. Scamp and Midnight were black and mostly some kind of spaniel. So was Smokey, Uncle Wayne’s dog. We’re going to load more boxes, and then, the furniture. He’s gonna wish he hadn’t kept that heavy old crowbar.